Enjoy Florida Grand Opera’s Meet the Artist series, where we profile several artists who will be performing onstage this season. 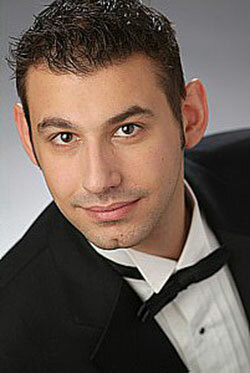 We are proud to introduce tenor Michele Angelini, who will be singing the lead role of Elvino in Bellini’s La sonnambula at the Adrienne Arsht Center for the Performing Arts of Miami-Dade County - February 9, 2013, through February17, 2013. Florida Grand Opera (FGO): Welcome to Florida Grand Opera – we’re very excited to have you with us for the first time! Michele Angelini (MA): Thank you, I am so happy to be here. FGO: What is your first operatic memory? MA: I don't distinctly recall the first time I heard opera, but I know I was extremely young. I grew up listening to classical music and, without a doubt, opera was part of my childhood, at least in the form of the Three Tenors albums and various operatic compilations. FGO: What got you started in opera? MA: The moment when I really fell in love with opera was the first time I watched the movie Amadeus. Hearing that singing, which turned out to be June Anderson, made me want to listen and know more and, from then on, it became a natural part of my life. I have been an instrumentalist most of my life and I always had a voracious appetite for learning and listening to music. As I discovered opera recordings I would sing along, at pitch if I could. I also sang in choruses and would learn arias for my own enjoyment. I didn't actually begin studying voice seriously until my first year at university. FGO: You made your debut at the Metropolitan Opera covering Juan Diego Florez as Tonio in La Fille du Regiment. Tell us about that experience. MA: I had an amazing experience my first season at the Met. I would wager that my first cover experience was one of the greatest and most rewarding experiences a singer could hope for in that position. I had the opportunity to sing most of the rehearsals for La Fille du Régiment while Mr. Florez was performing elsewhere, and to have had the opportunity to work with such phenomenal artists as Diana Damrau, Marco Armiliato, and everyone involved was truly incredible. I kept thinking I was dreaming! FGO: Who has influenced your life/career the most? MA: This is a very difficult question to answer. I've had so much support and influence from so many wonderful people throughout my life - teachers, colleagues, collaborators, and friends. It's impossible to mention everyone, but some of my biggest influences have been Martina Arroyo, Renata Scotto, Jane Marsh, Mark Rucker, Charlie Riecker, and Bliss Johnston Virago. I can say that some of my earliest, continued and most direct influences are the composers themselves, their lives, and their music. My two heroes have always been Beethoven and Michelangelo and I've drawn much inspiration from them for my own artistic values. FGO: You are making your FGO debut in the title role under the direction of Renata Scotto, who you mentioned was an inspiration for you. How do you feel about working with her? MA: Signora Scotto has been a huge mentor of mine and I studied with her as I was making my transition into the professional world of opera. I owe a great deal to Signora Scotto. She helped me cultivate voice and learn about style, acting, and really embracing the bel canto roles, which have become central to my repertoire. In fact, the first time I worked with her, she had me sing the duet from La sonnambula and told me then it would be a role that I would sing one day. I am thrilled beyond words to know that I will be working on this iconic piece with someone who has long been my mentor and who helped me to embrace my decision to pursue this profession and art, not to mention her legendary experience with this opera! FGO: Do you have a routine that you always follow during a production? MA: I try to keep myself healthy, grounded, and in shape. I usually do some type of cardio and/or yoga the day of a performance. I believe it really helps with breathing and getting the body warmed up for what ultimately is an athletic activity. During a production, I try to avoid being in loud or noisy places, not drink alcohol, and make sure I get enough water and sleep! FGO: Do you have dream role that you would like to perform? MA: There are a few dream roles I have in mind that are certainly within reach, but I still have some time to go before I decide to take them up, like Arnold in Guglielmo Tell and the Duke in Rigoletto. A few others are certainly possible now like La Dame Blanche, Le Postillon de Lonjumeau, as well as operas by Salieri, Haydn, and the Italian Baroque composers. Oh, and Zerbinetta...and Lady Macbeth! Hey, a guy can dream, can't he?! FGO: What do you most/least like about the being an opera singer? MA: I have to say that the best aspects of being an opera singer are: getting to do what I love day in and day out, singing and learning such fantastic repertoire; having the chance to work with inspiring artists and colleagues, making wonderful new friendships along the way; and traveling to great cities and seeing the world! The least fun part is living out of a suitcase and singing with jet lag! FGO: What do you do on your off time? MA: To be quite honest, I'm about as big of a music nerd as one can possibly get, so my work is my hobby. I am always listening to new things and discovering different recordings. I spend a lot of time in libraries doing research and finding new and interesting repertoire to perform. I also do a lot of reading, enjoy cooking, visiting museums, working out, spending time with close friends, and I've even found myself beginning to write poetry. FGO: Is there any in specific that you would like to do or see while here in Miami? MA: I know it’s January, but I plan on hitting the beach! FGO: Thank you for your time today, Michele. We look forward to seeing you in Miami for La sonnambula.